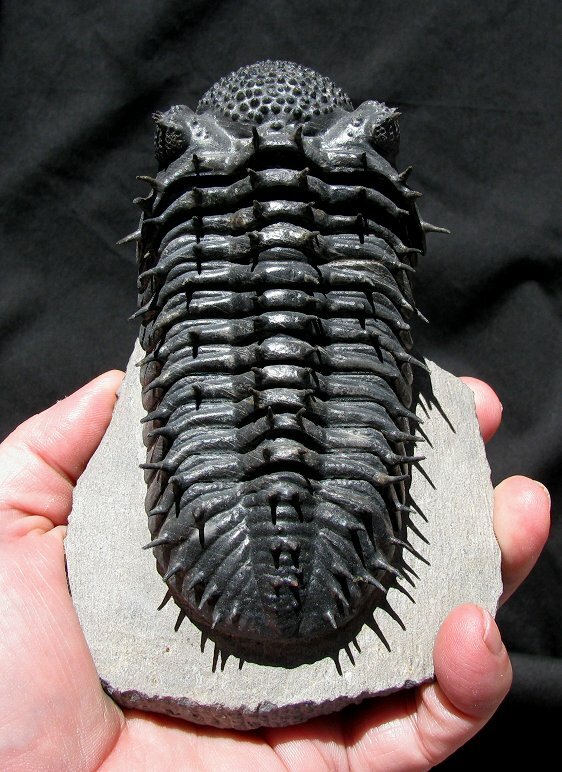 This is an extremely spiny trilobite. It is a large Drotops armatus from Morocco. This stunning specimen was prepared under a microscope in the EXTINCTIONS Prep Lab here in Colorado. This impressive trilobite has many, MANY free-standing spines protruding from the head, body, and tail. The bug is extremely inflated and 3-D and beautifully showcased on the sculpted matrix block. The naturally-black, thick-shelled exoskeleton of the trilobite is wonderfully detailed and very well preserved. BOTH large, compound faceted eyes are amazingly intact and practically flawless - this is a very rare occurrence. And the entire cephalon has been prepared free-standing, exposing the large hypostoma (mouthplate). This is a beautiful and striking example of this large Moroccan ''Spiny Phacops''.